After strengthening into a Category 1 hurricane Tuesday afternoon, Isaac made landfall in extreme southeastern Louisiana Tuesday evening, according to the National Hurricane Center in Miami. The storm reached the Louisiana coast in Plaquemines Parish just southwest of the mouth of Mississippi River at 6:45 p.m. Central and 7:45 p.m. Eastern with maximum sustained winds of 80 mph, the National Hurricane Center said. As of 11 p.m. Eastern, the center of Isaac had the same level of maximum sustained winds as it moved northwest at 8 mph about 75 miles southeast of Houma and 75 miles south-southeast of New Orleans. Tourists, listen up, the Florida Keys are back open for business. That's what Keys officials want visitors to know after they opened the gates to tourists once again Monday. 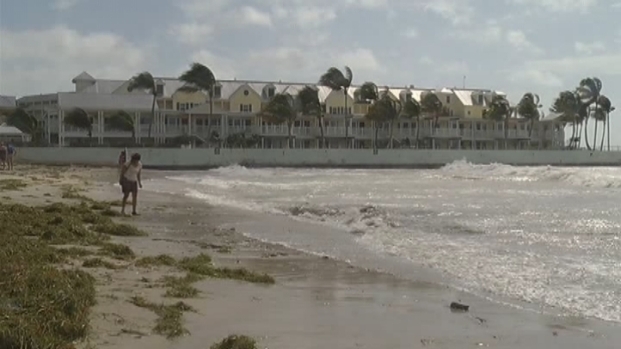 They had strongly recommended tourists leave in anticipation of Tropical Storm Isaac. Harold Wheeler, director of the Monroe County Tourist Development Council, said the area is looking to Labor Day Weekend. Storm surge flooding is occurring, and hurricane-force winds extend outward up to 60 miles, according to the NHC. Gov. Rick Scott said Tuesday he remained concerned about flooding in the Florida Panhandle but was confident the whole state would be sunny and ready for tourists by the weekend. "Right now, storm surge is happening, we're hours away from tropical storm force winds, we're going to have rain," Scott said. "Everybody needs to be cautious." He said he didn't anticipate as much rain in the Panhandle as pounded South Florida in the last few days. Although Isaac's approach on the eve of the Katrina anniversary invited obvious comparisons, the storm is nowhere near as powerful as Katrina was when it struck on Aug. 29, 2005. Katrina at one point reached Category 5 status with winds of more than 157 mph, and made landfall as a Category 3 storm. Many residents along the Gulf Coast opted to ride out Hurricane Isaac in shelters or at home and officials, while sounding alarm about the dangers of the powerful storm, decided not to call for mass evacuations. Still, there was a threat of storm surge and the possibility of nearly 2 feet of rain as it slowly trudges inland. Still, forecasters at the National Hurricane Center warned that Isaac, especially if it strikes at high tide, could cause storm surges of up to 12 feet along low-lying areas. 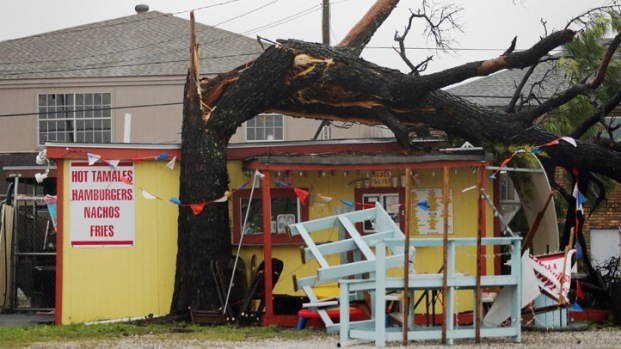 A storm surge of 8 feet was reported at Shell Beach, Louisiana, the hurricane center said. Rainfall of 7 to 14 inches was expected over much of Louisiana. The storm was expected to continue moving near or over the southeastern coast of Louisiana overnight. In a brief news conference from the White House Tuesday, President Barack Obama urged residents of the Gulf Coast to listen to local authorities and follow their directions as Tropical Storm Isaac approaches. Obama told Gulf Coast residents, "Now is not the time to tempt fate. Now is not the time to dismiss official warnings. You need to take this seriously," he said. 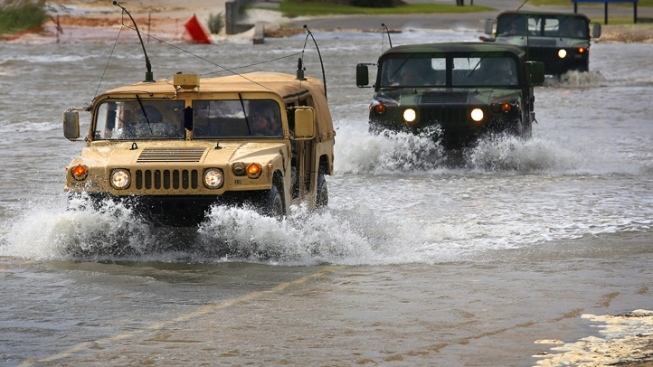 In the Big Easy on Monday, Mayor Mitch Landrieu did not activate a mandatory evacuation. Instead, officials urged residents to hunker down and make do with the supplies they had. Federal officials said the updated levees around New Orleans are equipped to handle storms stronger than Isaac. The hurricane warning from the Mississippi-Alabama border eastward to Destin, Florida is now a tropical storm warning. A hurricane warning was in effect for east of Morgan City, Louisiana to the Mississippi-Alabama border, including metropolitan New Orleans, Lake Pontchartrain and Lake Maurepas, while a hurricane watch was in effect for Intracoastal City to Morgan City. A tropical storm warning was in effect for the Mississippi-Alabama border to Destin, Florida and Morgan City west to Sabine Pass, Texas. Meanwhile, in Tampa, the Republican National Convention started its first full day Tuesday, after Isaac forced organizers to delay most of the events on Monday. In South Florida, a flood warning was in effect throughout Tuesday as more rain was possible in South Florida in the aftermath of Isaac. The flood warning was in effect until 8:30 p.m. Meanwhile, Tropical Storm Kirk formed over the eastern Atlantic Tuesday but was no threat to land, the National Hurricane Center said. As of 11 p.m., Kirk had maximum sustained winds at 45 mph and was moving west at 12 mph. It was located about 1230 miles east-northeast of the northern Leeward Islands and 1440 miles southwest of the Azores.